One area of our museum expansion projects that has been getting a lot of action recently is the planning of the exhibits to be featured. Jerry Adams from Media Rare in Grand Rapids has been a consultant for our project and has designed the new displays. 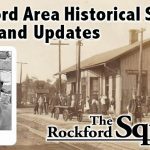 Members of the Rockford Area Historical Society (RAHS) board of directors were updated on his ideas during a two-hour presentation last week and were impressed with his plans. Changes could still be made, but the layout and use of space is well thought out. The next step is to price out the cost of the exhibits, so that we can see how it fits into our budget. The Rockford City Council has asked for the layout and the cost, and both will be done soon. Fundraising continues and the responses are greatly appreciated. When we started the project, some people told us that the timing was bad, and the economic situation would work against us. The courthouse was available now so the timing was also now. Several of us looked at each other and said, “This is Rockford.” If any area can make it work, Rockford can. Because I have lived here for 52 years, I know the pride that exists in the community. In my experiences with education and athletics as a teacher and coach at Rockford High School, I often saw our area band together to get things done. We have a great and valuable history and the following is an updated list of donors who are supporting our new museum. 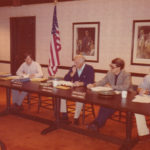 Walter and Marianne Andersen, Judy and Tom Baer, Harold and Donna Bailey, Richard and Sue Bakita, James and Shirley Balk Foundation, William and Christine Bedford, Eric and Anita Bennett, Gene and Sharon Berry, Donald and Patricia Bixby, Neil and Mary Blakeslee, Paul and Joyce Blakeslee, Blakeslee Plumbing and Heating, Blakeslee Rop PLC, Carla Blandford, Jim and Susan Bodenner, Andrew and Kelly Bolt, Jack and Madelyn Bolt, Katherine Bolt, Polly Bolt, James and Nancy Ferrand Boxall, Robert Boyer, Marvin and Joan Bunn, Robert and Nancy Burch, Byrne Electrical Specialists Inc., Robert and Kathryn Christensen, Virginia H. Cox, Jerry and Joan DeMaagd, Tim Durham, James and Mary Eadie, Norrine Elkins, Stephen and Kathleen Ellis, Eric and Jill Ericksen, John W. and Sue Erickson, Ric and Kirsten Farmer, Henry and Sharon Finch, Gary and Peggy Fowle, R. Brian Frick Family, Jason S. Frick Family, Henry and Larry Glass, Jennie Griffee, Vance and Genevieve Harger, Dr. Robert Harris, Leslie Hartzell, Floyd and Sharon Havemeier, The Haverkate Family, Helen Hessler, Cliff and Nancy Hill, Arthur and Nancy Hobart, Lonnie and Cathleen Holton, Charles and Ann Hyde, Mary E. Johnson, Emiel and Orpha Kempf, Terry and Janette Konkle, Jack A. Krause, Vic and Joan Krause, Paul and Nancy Krupp, Elizabeth Kunze, Martha and Patrick Ladwig, Georgia Lazzaro, Jack A. Lewis, Larry and Paula Lindsley, Maghielse & Company, Roger and Mary Lou Mawby, Michelle Frick Milanowski Family, Robert and Cheryl Mol, Shirley Norman, Northland Auto Supply Inc., Nugent Builders Inc., Arlene Obetts, MaryLou Ohnsman, Jerold and Nancy Patterson, Ralph and Barbara Pitts, Al and Joan Pratt, R&W Krause Foundation (Att. Barbara Bunbury), Tom and Holly Rademacher, Donald and Susan DeMaagd Reithel, Rockford Community Federal Credit Union, Rockford Floor Covering, Rockford Package Supply, Samuel’s, Honorable David Sawyer, The Jack Schwab Family, Dianne Skiver, Ray and Linda Springer, Jon and Carlene Stamp, Charles and Barbara Stevens, Kenneth and Versa Stoner, John and Dana TenElshof, Thoms Hair Design, Bernard and Ann Tompsett, Joyce Torrey, Rick and Eileen Van Horn, Thomas Vredevelt, Thomas and Kathleen Wachter, Mary B. Walker, Rick and Sally Warren, Gil and Denise Webb, Stanley and Joan Weir, Carolyn Wills, Wilson and Wilson Dentistry, Robert and Geri Winegar, Wynalda Packaging, Bernie and Bette Young, Bernard and Julie Zahm, and Barbara Zenk. Our thanks to all of the above for their positive support. We are working hard at getting out to contact others. If readers wish to help us, donations can be sent to: Rockford Area Museum, PO Box 781, Rockford, MI 49341, or contact Terry Konkle at (616) 866-0530.